Pincus was born on April 9, 1903, in Woodbine, New Jersey to a farming family. 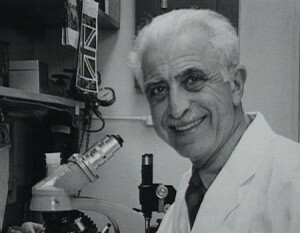 Following his parents’ example, he studied agriculture as an undergraduate but moved to genetics and reproductive physiology at Harvard University, where he earned his doctorate in 1927. His graduate research concerned the links between hormone secretion and egg development, and the stages of fertilization and embryonic growth. After studying in Europe with pioneers of endocrinology (the study of the hormonal system), Pincus returned to teach at Harvard in 1930. In 1938 he moved to Clark University, in Massachusetts, where he conducted research for the United States Air Force on the link between hormone secretion and the stresses of flying. In 1951 Pincus was encouraged to explore the possibility of hormone ­controlled contraception by feminist Margaret Sanger, a vocal advocate of controlling human population growth with the introduction of a new, effective birth ­control method. In 1953 Pincus began collaborating with Min­ Chueh Chang to investigate the effects on fertility of steroids, a family of substances including the reproductive hormones. With the help of human­ reproduction specialists, Pincus and Chang soon produced a pill containing synthesized progesterone and estrogen, the two main female reproductive hormones. This pill prevented (in laboratory animals) ovulation, or the release of a mature egg (ovum) from the ovary; by disrupting the cascade of hormone secretions that regulates the female reproductive cycle. In 1954 the researchers conducted clinical trials of their product in Haiti and Puerto Rico, showing it to be effective. They thus created a nearly 100% effective form of birth control. Pincus worked and traveled during his later years, despite encroaching illness. He died on August 22, 1967, in Boston, Massachusetts. “The Pill,” as Pincus’s oral contraceptive came to be known, eventually became a popular, effective, and relatively safe contraceptive used around the world. It helped to liberate many women from the fear of unwanted pregnancy, allowing them more social and economic freedom than ever before. The Pill was approved by the U.S. Food and Drug Administration in 1960; such an effective and convenient birth­ control method created great excitement. Some observers argued that too few tests had been done to warrant the immediate wide­ scale prescriptive use that ensued. By 1962 an estimated 1.2 million women in the United States were taking the Pill; by 1973 the number was 10 million. By the late 1960s research began to reveal the potential dangers of Pincus’s original formula for the Pill. High doses of synthetic hormones caused numerous negative effects, such as weight gain, skin problems, hypertension, headaches, depression, decreased libido (sexual drive), nausea, diabetes, urinary tract infections, and other complications. For women with certain pre­existing conditions, such as diseases associated with excess blood clotting, liver diseases, and breast cancer, the Pill was shown to be dangerous and, in some cases, lethal. In 1969 physician Barbara Seaman published A Doctor’s Case Against the Pill. The book brought to the public’s attention the Pill’s potential dangers and the lack of medical knowledge about the long ­term effects of subjecting the body to daily doses of synthetic hormones. Popular concern led to modifications of the Pill, including incorporating greatly reduced levels of hormones in its formula. Today, millions of women choose the Pill as a convenient, effective way to prevent unwanted pregnancies, although some dangerous side effects may still exist. Pincus’s work led to further development of hormone ­based birth control, including several progesterone ­only pills, implantation and injection of slow­ release hormones, and single ­dose abortion pills. Hormone research also led to the 1965 discovery that estrogen therapy for post­menopausal women (whose estrogen levels decline with age) decreases the risk of osteoporosis, a debilitating disease that causes bone disintegration.